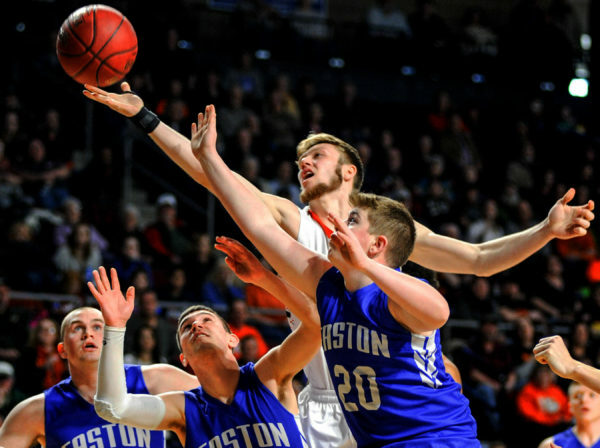 James Mersereau, Machias, grabs a rebound over Easton’s Jacob Flewelling, Hunter Brown and Collin Sotomayor second half action of their boys class D semi final game at the Cross Center in February. The University of Maine at Fort Kent men’s basketball team boasts a recruiting class for the coming season that literally extends from coast to coast. Among those set to join coach Tom Bird’s Bengals this fall are two Maine high school products, James Mersereau of Machias and Andre Rossignol of Caribou, along with junior college additions from California, Florida, Michigan and Oregon. Mersereau led Machias Memorial High School to its first Class D state championship in 22 years last winter. The 6-foot-4 guard was the recipient of the Bangor Daily News William C. Warner Award as most valuable player of the 2017 Class D North tournament. He averaged 14 points during regional play including a game-high 20 points as coach Jim Getchell’s Bulldogs’ defeated Southern Aroostook of Dyer Brook in the North championship game. “James is someone who has played on winning teams and someone we think will have a chance to get on the floor right away with his athleticism and winning attitude,” said Bird, the 2017 USCAA Division I coach of the year. Rossignol, a 6-foot guard, returns to the sport at UMFK after sitting out his senior year at Caribou. 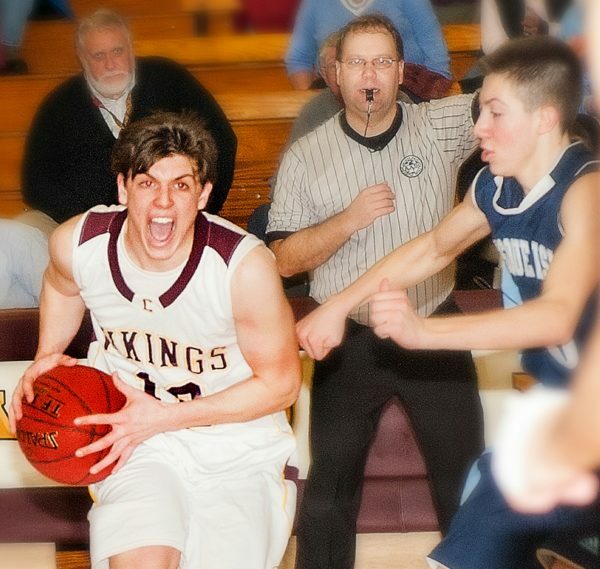 The son of former University of Maine standout Matt Rossignol and brother of current Black Bear Parise Rossignol, he was a 1,000-point scorer while playing at Van Buren and Caribou. Other recruits are Troy Williams, a 6-2 guard from Treasure Valley Community College in Ontario, Oregon, who averaged 12.7 points and 4.3 rebounds and made 71 3-pointers last winter; Jarid Walton, a 6-5 forward from Mid-Michigan Community College in Harrison, Michigan, who averaged 6.5 points and 5.4 rebounds last season; Patrick Pauwels of Miami (Florida) Dade Community College; and John Caldwell, a 6-5 forward from Contra Costa Community College in Oakland, California. UMFK is rejoining the National Association of Intercollegiate Athletics in all sports beginning Aug. 1 for the first time since 2010, and as a returning member the Bengals will be eligible for postseason play immediately rather than enduring a two-year waiting period before gaining eligibility as is the case with new NAIA members. The school also will remain affiliated with the USCAA, which it joined in 2012. Among UMFK’s early basketball tests next season will be a Nov. 22 game at the University of Vermont, the reigning America East champion and a participant in the 2017 NCAA Division I tournament.